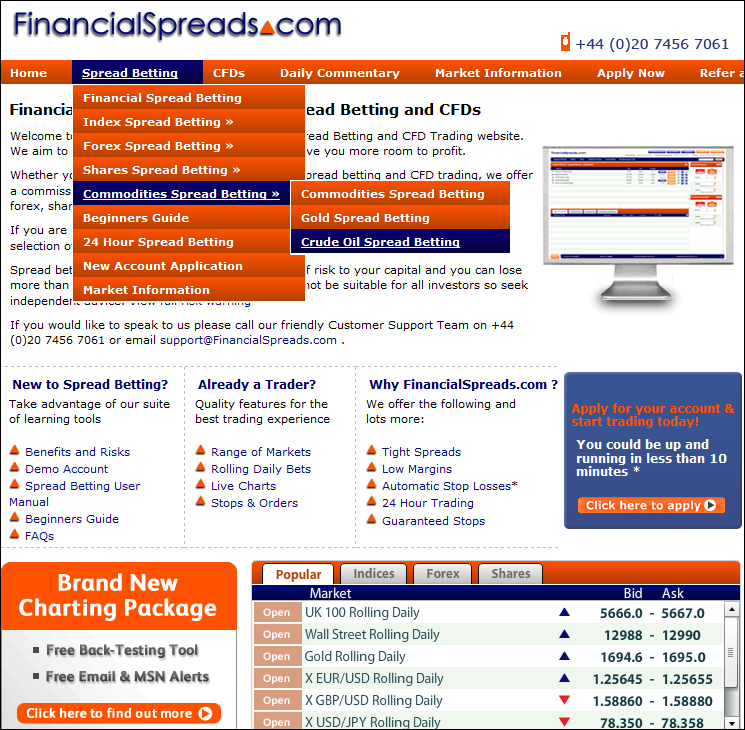 Financial Spreads, the UK based spread betting and contracts for difference (CFDs) company, have redesigned their website. Key features of the updated website are the top and bottom menus as well as a range of new trading guides. Adam Jepsen, spokesman for www.financialspreads.com, said the new design will make it easier for users to access the wide range of financial spread betting and CFD guides that are on the site. "Since we started offering our new commission-free CFD service, we have spent a lot of time improving existing guides and adding new trading guides. Of course, that has meant that we have also had to improve the design of FinancialSpreads.com. "The site has been streamlined and it is easier for clients who prefer to concentrate on spread betting to find the relevant guides for that form of trading. Likewise, it is just as easy for clients to access the CFD trading guides." Financial Spreads offers more than 2,500 markets which users can trade as spread bets and/or CFDs. There are live professional level charts for each market as well as a variety of risk management and trading orders. Therefore, according to Jepsen, it has been important to keep the site simple and easy to use. "We have made the positive decision to keep the live trading platform unchanged. When clients log on they will see the same, user-friendly-yet-professional trading platform they are familiar with. It's a case of, if it ain't broke, don't fix it". Before trading, please note that financial spread betting and CFD trading are leveraged and therefore they carry a high level of risk. Ensure financial spread betting and CFD trading meet your investment objectives. Seek independent financial advice if you do not understand the risks. Financial Spreads offers clients trading orders such as Guaranteed Stops, OCOs and Trailing Stops across a broad range of forex, shares, indices, treasuries and commodities markets. The Financial Spreads service is commission-free, there are no brokers' fees and clients can trade over the phone or via the web, http://www.financialspreads.com.